The international path of the Amsterdam exchange from 2000 onwards, summarized in three logos. From the top down: Euronext (2000-2007), NYSE-Euronext (2007-2014), and again Euronext (2014-present). ABN AMRO was proud of its role in the completion of the merger between the exchanges in Amsterdam, Brussels, and Paris into Euronext in 2000. 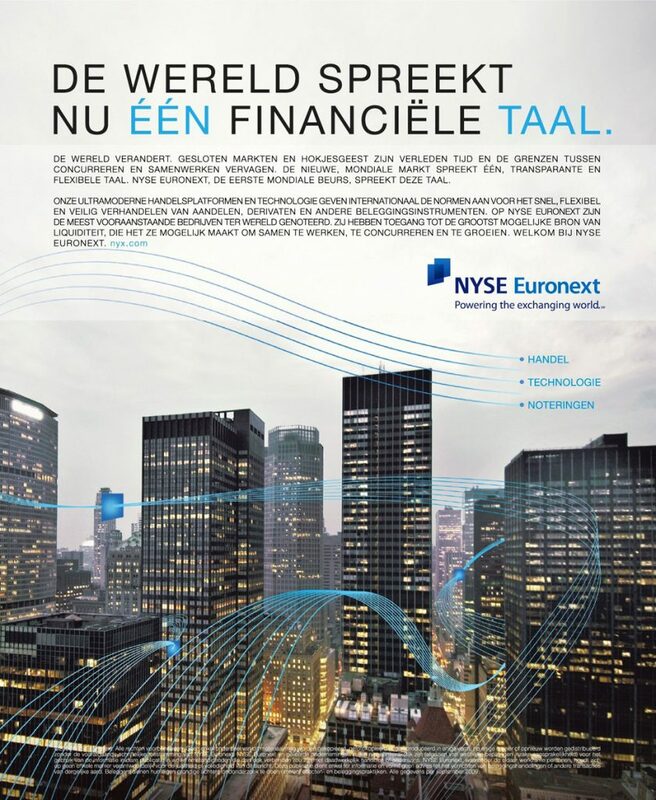 A 2009 advertisement of NYSE Euronext, the transatlantic exchange group that the Amsterdam exchange was part of between 2007 and 2014. 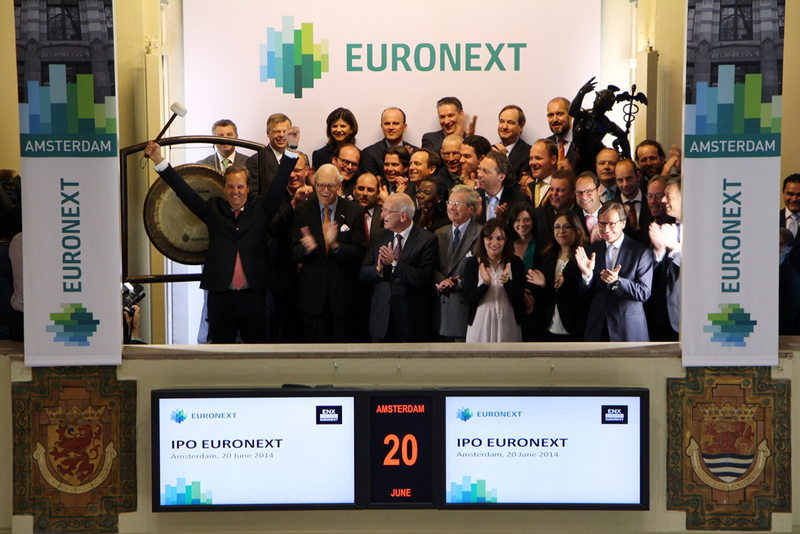 After an Initial Public Offering in June 2014, Euronext became independent again. From the outset, the Amsterdam securities exchange always had a strong international focus. It is not without reason that the Amsterdam exchange for a long time was considered to be a financier of foreign countries. From the late 19th century, the period of the Second Golden Age, onwards, this gradually started to change. A large influx of domestic companies made the Amsterdam exchange into the ‘engine of the Dutch economy’, a national institution that was cherished. Therefore, it caused great turmoil when plans for an international merger were made public in the late nineties. Opponents feared that the individual character and the national financing function of the Amsterdam exchange would be jeopardized. Proponents believed that an international merger was a logical and necessary step considering the arrival of new players, the introduction of the euro, and the progressing digitization and globalization of securities trading. The proponents constituted the majority and got what they wanted. 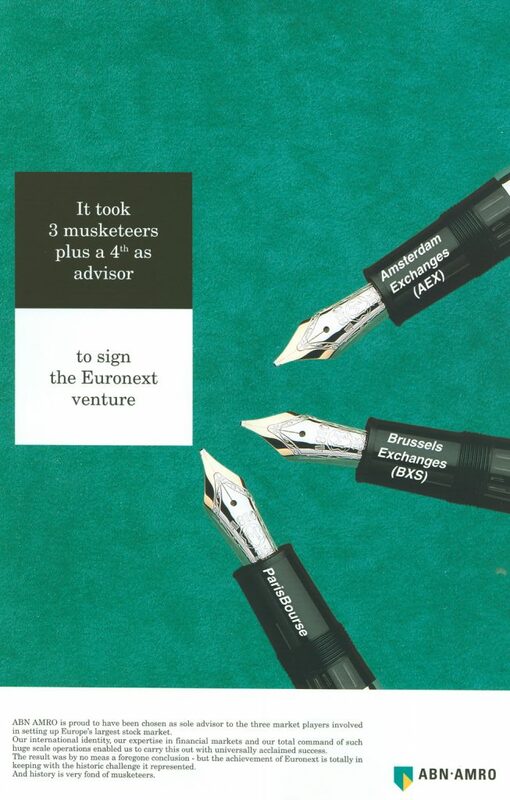 In September 2000, Amsterdam Exchanges merged into the European exchange group Euronext along with Brussels Exchanges and Paris Bourse. In all three cities, Euronext managed both the securities market and the derivatives market. In 2002, Euronext was expanded with the stock and derivatives exchange in Portugal, and LIFFE, the London derivatives exchange. In 2007, Euronext merged with the New York Stock Exchange (NYSE), and the Amsterdam exchange became part of the transatlantic exchange organization NYSE Euronext . After a merger attempt between NYSE Euronext and Deutsche Börse, which failed due to EU competition authorities, NYSE Euronext was bought by US commodity and energy exchange Intercontinental Exchange (ICE) in 2013. ICE was mainly interested in NYSE and LIFFE. The exchanges in Brussels, Lisbon, Paris, and Amsterdam were split off under the former name, Euronext. After a mid-2014 listing on its own stock exchanges, Euronext is now back on its own feet. Whether the ‘international train’ has now reached its final destination is highly questionable. Again, rumors of takeovers are circulating, and the importance of scale expansion is stressed. Conversely, criticism of the position and operational freedom of Amsterdam in an international exchange organization is still never far off either. An important question regarding this matter is whether the Amsterdam exchange is sufficiently able to act as a financier in the Dutch business community the way it used to.